The Prefco/Bullock combination air/smoke/fire damper is a unique 3 in 1 damper. Designed to perform three important but basic functions within a buildings heating, ventilation or air conditioning (HVAC) system. A fire damper, to stop materials of combustion transferring throughout a building and retain a compartments fire integrity. A smoke damper to control toxic smoke from a fire zone. To simply control conditioned air in various areas when required. A combination of all three in the one fire rated elements. Model 5000 Motorised combination air/smoke damper. The model 5000 Prefco/Bullock motorised air/smoke damper features a 1.6mm galvanised steel fire damper casing complete with flange angles. Roll-formed galvanised steel blades are centre pivoting allowing bi-directional airflow and operation at elevated temperatures. This unique blade design is airflow tested proven to be superior to airfoil type designs, resulting in less airflow resistance. the actuator drive is a zinc plated 1/2 inch round shaft which is mechanically fixed to the plates via stainless steel pivots ensuring a smooth positive blade action at various velocities. Zero torque is required when the damper blades are in the closed position due to the patented knee action black locking and smoke sealing system. 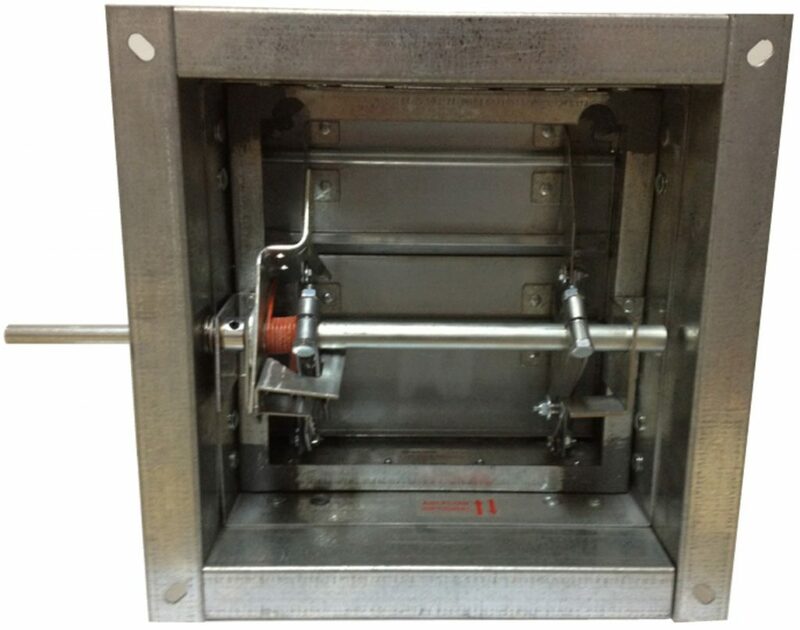 Model 5000-Motorised combination fire/smoke damper. The model 5020-1 Prefco/Bullock motorised smoke/fire damper is based upon the model 5000 and comes complete with the McCabe link. The McCabe link is a 68 degree C. Re-settable, re-usable bi-metallic thermal link. Once the disconnect temperature of the link is reached, the spring loaded damper blades snap closed. The patented knee action blade locking system holds the blades tightly closed. This can be overridden but only if the link has cooled to a temperature below 68 deg C. and if the actuator is still operational, to cycle the reconnection of the link to the blades. Smoke purging of the fire zone can then be achieved if the actuator power is then de-energised. Expansion gap spacers will come fitted to Bullock Fire Dampers to ensure the damper is centered within the penetration, they will not sag like other insulated products leading to gaps above the damper over time. They do not completely encapsulate the damper making installation easy even in the ugliest hole! EXOVA 2hr Plasterboard wall installation. C.S.I.R.O. 4hr Masonry wall installation. The McCabe re-settable, re-usable, bi-metallic thermal 68 C. Link (Standard). TDF/TDC channels solve the problem of how to connect duct to a fire damper creating an air tight seal and still maintain a breakaway joint. However, having to notch the duct when connecting to Motorised Fire/Smoke dampers was a definite problem. With the new ETDF/ETDC the drive shaft no longer gets in the way of the duct connection and the actuator gets mounted on the damper channel, where it should be, not on the duct. Bullock have made compliance with AS1682.2 much easier, but remember, only use nylon bolts and nylon cleats. Looking at this view, the damper shown here is LEFT HAND DRIVE. If the damper is installed in the wall and the controls (drive shaft) are in front of you, you choose what side you want to drive from, left or right…..YOUR LEFT OR RIGHT. 7. Options: TDF/TDC flanges and Metal expansion gap spacers.